We got these rose plants a few years ago from a family member and have no idea what kind they are. As you can see, we do get roses, but usually not more than one or two at a time. There is brown in some places including the bottom and tips of some otherwise healthy looking green stems. I'm sure I haven't supplied enough information here. Any pointers would be great. These roses are in need of pruning. 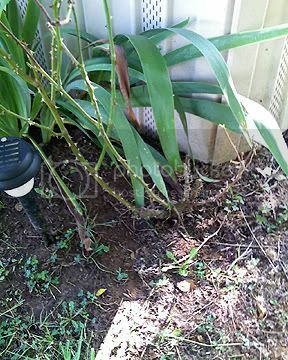 If someone uses the word "leggy" with regard to these plants, it means that the canes look "too long" in relation to the plant as a whole. Pruning is best performed when the plants are dormant. Maybe in January where you live? 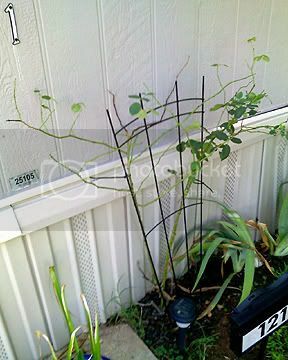 Take a look at (I think) the Sticky in the Rose Forum on pruning. 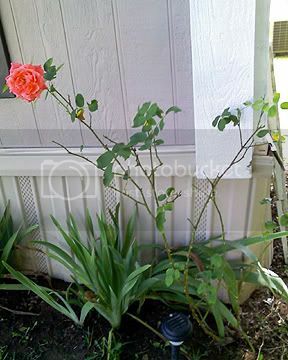 If the Sticky doesn't cover it, then a search on The Helpful Gardener for "rose pruning" will give you lots of help. Thanks, Cynthia. I live in North Louisiana, USA. It is hot here with little rain lately. I will take a look at the sticky. Roses love, love love direct sun and need a little more space than what you have there. They are leggy and too close to the building. I might just do that very thing. The wife "laid out" the landscaping. I basically took over after that not knowing anything. Now, to persuade her to move 'em and keep 'em or leave 'em and lose 'em. FATZ wrote: Now, to persuade her to move 'em and keep 'em or leave 'em and lose 'em. Loosin 'em sounds like persuasion enough... Good luck on that. COME ON AUTUMN!!! I really want to get these plants pruned. It wouldn't hurt to trim them. Every area and type of rose is different. I let mine talk to me. I'm in Southern California and cut them a few times a year just depending on the growing season. I cut them way back in late fall for the winter but during the summer and sometimes early spring they need a trim for shape.